Disclosure: This post is sponsored by Challenger Sports – British Soccer Camp and US Family Guide. Last week, my kids attended the Challenger Sports – British Soccer Camp. It’s a week-long summer camp that focuses on developing soccer skills, speed, and confidence in players ages 3-18 – which meant that BOTH kids could go to the same camp and get something out of it! The camp brochure said that the kids would “receive high-level soccer coaching from a team of international expert’s” and it was true! Their coach was awesome! Not only was he an expert in soccer but he made the morning FUN! The kids especially loved that there were a LOT of scrimmages. They also liked the skill building drills – but they loved the chance to actually play the game with new friends from across the local area. I was excited to get the kids back into the game after not playing since the previous fall. The camp was the perfect way to brush up on old skills, learn some new ones, and get excited for our upcoming local soccer season. In the camp, the three coaches were great! They taught the kids not only soccer skills, but they learned about respect, responsibility, integrity, sportsmanship and leadership. Each day the coaches gave the kids opportunities to earn points by demonstrating these core values….and even held a world champion soccer competition. The photo above is our coach getting ready to award the world cup! And here’s the winning team! It was a close competition….with points given to each of the world team for skills demonstrated, points made in games, coming back from breaks on time, etc. I was a little worried about doing a camp in the middle of the Sacramento heat (it was expected to hit over 100 degrees all 5 days) but the coaches took excellent care of the kids. Lots of water breaks, fun games, resting in the shade etc. Before the camp began, the kids were super excited to receive their soccer jersey (a perk from signing up early – 45 days before the camp starts). On the first day of camp, the coach also gave them their t-shirts and ball. The kids love that it’s a “real jersey” as well as a “professional” soccer ball. They can’t wait to use the ball in their team practices. I’m so happy that we decided to give Challenger Sports – British Soccer Camp a try! We’ll definitely be back next year! My only regret is that we didn’t sign up for the additional session that started right after our camp ended! 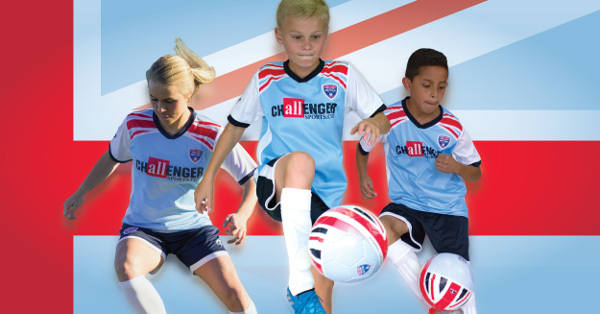 If you’re interested in a fun summer camp, be sure to try Challenger Sports – British Soccer Camp! They have so many locations that there’s bound to be one near you!